pertaining to the foot or feet. (ped'ăl), Avoid the mispronunciation pē'dal. Avoid the redundant phrase foot pedal. Relating to the feet, or to any structure called pes. /ped·al/ (ped´'l) pertaining to the foot or feet. (also pēd′l) Of or relating to a foot or footlike part: the pedal extremities. of or relating to the foot, particularly those of molluscs. adj pertaining to the foot. 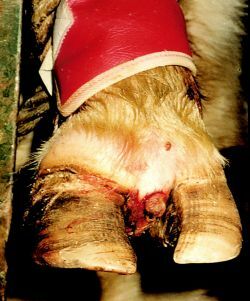 seen most often in cattle with septic arthritis of the distal interphalangeal joint. the distal phalanx of ungulates, especially the horse. causing penetration of the sole of the horse's foot; a characteristic of severe laminitis. fractures of the pedal bone occur most commonly in horses. They may involve a wing or extensor process. They are usually transverse in cattle. a rarefying osteitis of the pedal bone in the foot of the horse. Causes local pain and lameness. In the early 1900s, pedal cars were very popular and found almost everywhere, especially in the heartlands of car manufacturing powerhouses like America, Britain, Italy and France. Individual Guitar Pedal Information and a Media Kit are Available at the Scary Pedals Website. The majority of reported pedal misapplication crashes occur during the day, in clear weather, with good road conditions  and in commercial parking lots . the same circumference) provided conditions in which the same mechanical work was performed per pedal revolution even if the shapes differed. Bosch said extra fuel savings are possible when the pedal is used with stop-start coasting, and estimates that the engine could be stopped in this way on 30% of all journeys. Would different depths of pedal be appropriate in this piece? Pedal Party NW plans to follow this model, but Tom Lawson said he can also work with clients to create custom tours. Anne Glass already works on a number of voluntary projects, and was initially keen to be trained as a Play on Pedals instructor, but has done much more to develop cycling in Drumchapel in the last five months. Ben Merry, programme development officer at Sustrans, who are behind this year's event, said: "The Big Pedal proves that when cycling and scooting is part of the daily routine, it can play a vital role in improving the health and wellbeing of our children. Lateral rims on the pedal sole that do not participate in locomotory forces border the central part. While the portable Pedal Genny generator comes with an optional seat and is intended to generate power for one function at a time.